The spring and Easter season is here! 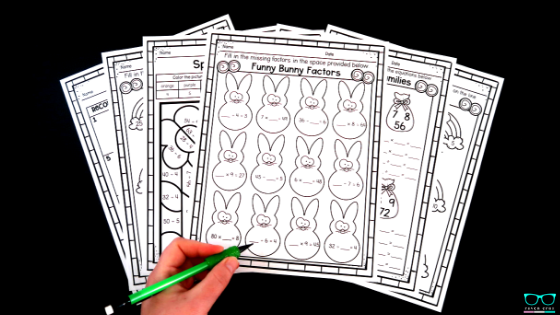 Check out these Easter math worksheets just for the occasion. 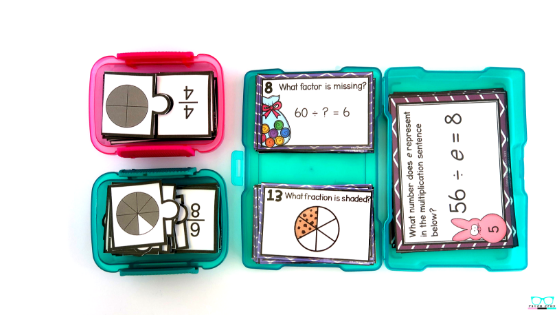 They come with task cards and games designed specifically for 3rd grade Mathematics standards. The bundle is GROWING bigger different objectives by the day so grab them now and SAVE! You can also purchase the bundles separately. So far the bundles cover two-step word problems using the four operations, using equations with a letter, multiplication and division fact families, and recognizing fractions as part of a whole, the difference between the numerator and denominator, understand that fractions can be represented on a number line, represent a fraction from 0 to 1, divide fractions into equal parts on a number line. The bundle at the time of writing this blog has 3 products. With that said, it will be growing until I start creating resources for summer. You can read in the paragraph above about what objectives the bundle cover or read more about each below. As I update the bundle, I will update this blog post explaining what I added. The dreaded "F" word. Fractions don't have to be so bad! 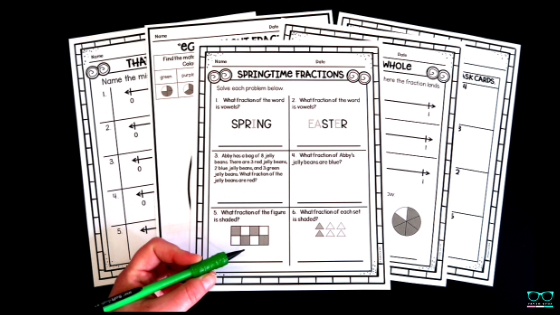 The fraction bundle comes with worksheets, task cards, and a game. 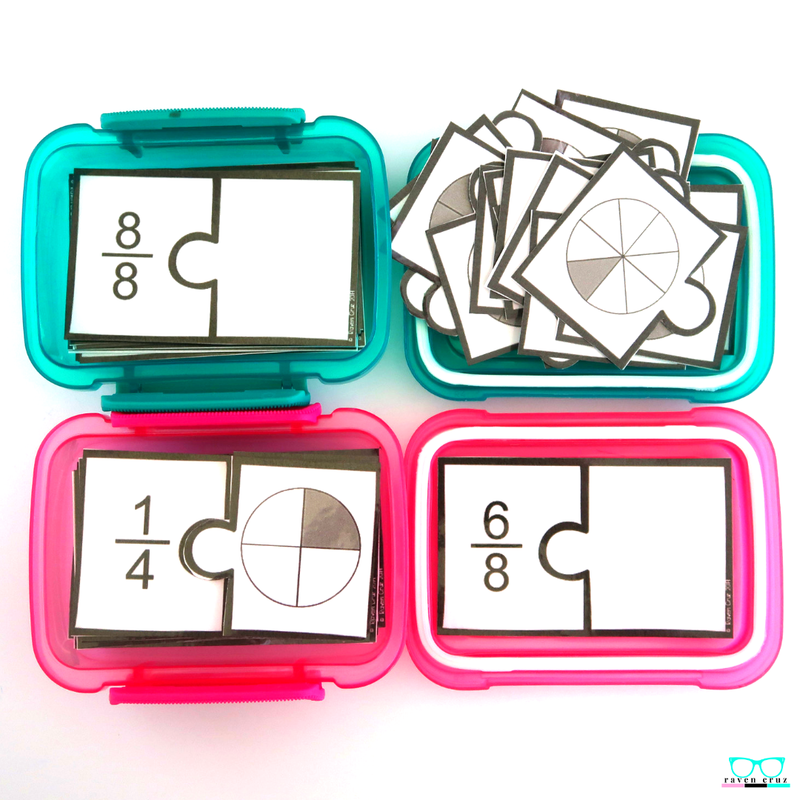 They game (shown in the photos below) is a fraction recognition and matching game. I print the game on heavy paper or card stock, laminate the game on my personal laminator (I have a cheap $30 Scotch laminator), and use hook and loop dots to stick the pieces to the cards. The cards fit perfectly in the 3" by 4" containers from the dollar store. The game cards fit perfectly in these 3" by 4" containers from the dollar store. The task cards included in the fraction bundle require students to identify the shaded portion of a fraction. I purposely did not theme the task cards or game so that teachers can reuse them throughout the year. You can see the task cards in the photo below. There are 4 worksheets in the fraction bundle as you can see below. The worksheets cover recognizing fractions as part of a whole, the difference between the numerator and denominator, understand that fractions can be represented on a number line, represent a fraction from 0 to 1, divide fractions into equal parts on a number line . Last, the fractions bundle aligns with standards 3.NF.A.1, 3.NF.A.2, 3.NF.A.2.A, and 3.NF.A.2.B, but will meet many state and district standards as well. The worksheets are not bogged down with a bunch of repetitive questions. I feel like this is an important feature in a resource because there are only so many hours that we have our students per day and 40 worksheets about fractions is not beneficial. If you have time for 40 fraction worksheets - you need to let the world in on your secret for time management! JK! Truly though, we don't want to bog our students down with all that busy work either. 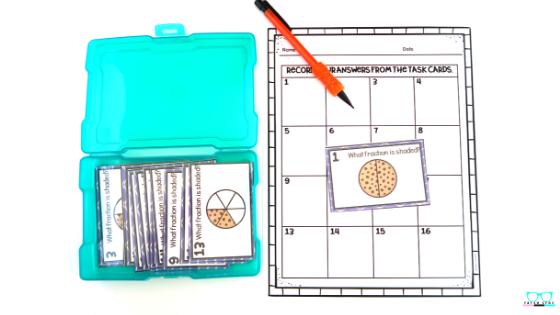 That is why the bundles come with task cards and games instead of just worksheets or printables. Multiplication and division fact families are one of my things to teach as well as make resources. Alternately, there are also a ton of resources out there for multiplication and division fluency. All each as cute as the next. I am not trying to sell you my resource saying it has this new strategy that no one else has. Nope! What is does have is efficiency and affordability. 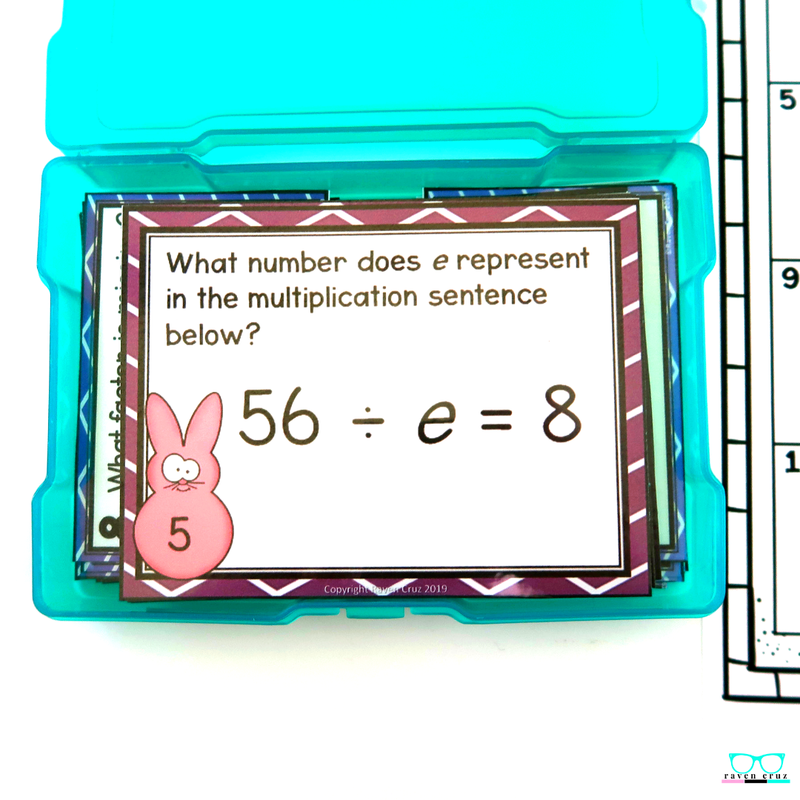 You don't need 50 different worksheets to teach fluency for multiplication and division, though there are enough out there. 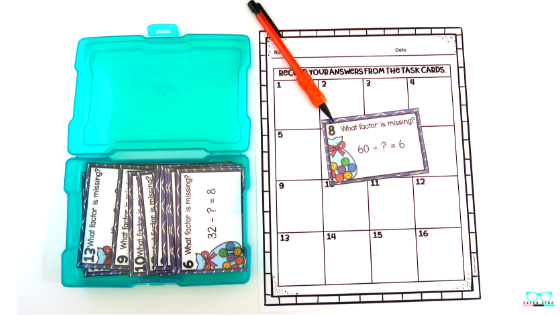 There are five worksheets in the bundle and a set of missing factor task cards. They touch on the things you need for this standard and add a little spring to your class without costing you a small fortune for 50 worksheets you won't use. 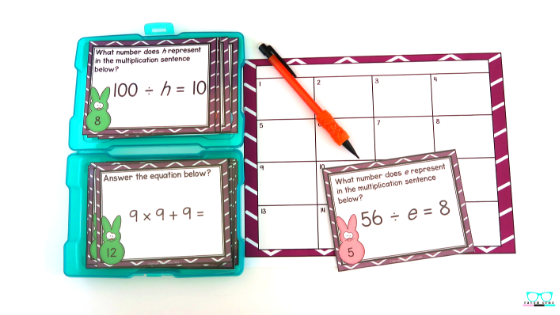 The two-step word problem bundle comes with worksheets and task cards to get students ready for algebra. Third-grade is the level that the objective to represent word problems using equations with a letter standing for the unknown quantity is introduced. Below are the task cards that help students prepare to compose these word problems. In this case, repetition helps renew the memory files and preps the students to become familiar with these type of problems. There several AMAZING word problem methods around to reinforce students ability to break down and understand word problems. My personal favorite is the CUBES method. It is not my personal method, so you will have to research that for yourself, but I find it is very beneficial in helping students again, break down the word problems. 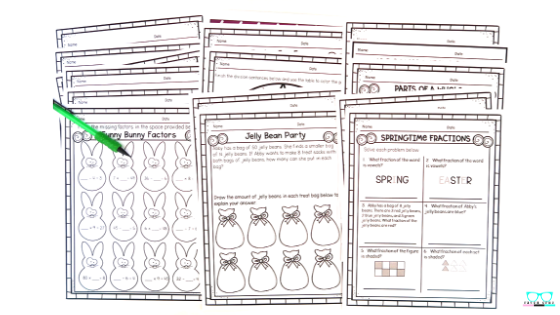 Below are four worksheets included in the bundle. There are three with diverse types of two-step word problems using the four operations. 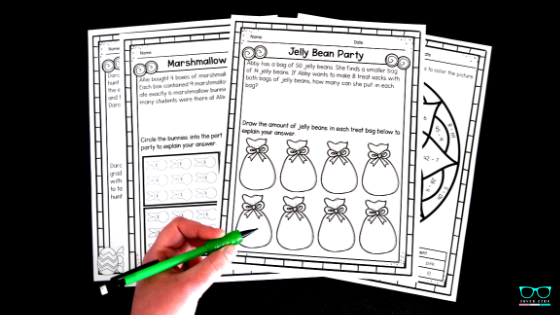 Jelly Bean Party and Marshmallow Bunnies (worksheets) would be perfect for a guided math lesson or rotations. Easter Egg Fun is the same kind of two-step word problem worksheet, but it has two word problems that tie in to each other and end up having the same answer. The fourth is a color by number division worksheet to be used for fluency practice or a differentiated option in the case that a teacher needs an option for other students that are not ready for the other three choices. Last in the bundle are these task cards pictured below. I am a certified mid/level math teacher (means I can teach up to Algebra 2 and Geometry) so I am not blowing smoke when I say it is VERY important to have a strong algebra base for students to struggle less with each consecutive year. Like I said above, 3rd grade is the level in which algebra problems like these are introduced and will just get more difficult each school year. The standard requires the word problems be composed using letters or variables standing for an unknown quantity. Also, this is where the beginning of the order of operations is introduced. As you can see in the photograph below the task cards include questions representing both objectives. For instance "9 × 9 + 9 =" is an entry level order of operations question. It does not require students to solve parenthesis first or use PEMDAS, but it does get them familiar with multi-step problems. Feel free to click on the photo below to visit the entire bundle and browse my store. I have many more 2nd-4th grade math resources as well as a few Pre-Algebra resources. Photo by Raven Cruz. The task cards from the bundle all fit perfectly in these colorful photo boxes. The game fits in these pretty dollar store boxes.